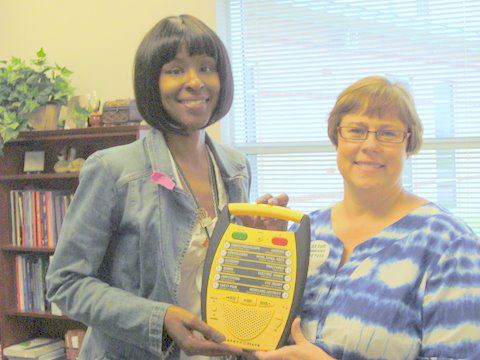 Monsanto, R. K. Smith’s Adopt-A-School partner, donated four SafetyMates to be used throughout the school building. The SafetyMate is a portable electronic device that audibly delivers emergency response information in an interactive format. The device will guide school personnel through calm and clear instructions for a specific emergency. Pictured are Nicole LeBeauf, principal, and Nancy Miller, Monsanto’s nurse. Miller inserviced the faculty on the SafetyMate device.